Emerson Drive is a band founded in Grande Prairie, Alberta, Canada in 1995. The band is Brad Mates (lead vocals), Danick Dupelle (guitars and backing vocals), Mike Melancon (drums), Dale Wallace (keyboards and backing vocals), and David Pichette (fiddle). Early on, the band found minor success in Canada, releasing two albums under the name of 12 Gauge, the first Open Season was a product of winning a local "Battle of the Bands" contest. They then charted two singles on the Canadian country charts and a music video on CMT. 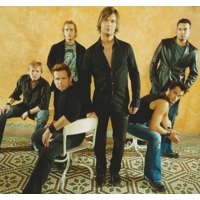 By 1999, they changed the name to Emerson Drive, and had moved to Nashville, Tennessee to find a major label record deal. Emerson Drive recorded two albums on the DreamWorks Records label, and charted several hits on both the U.S. and Canadian country music charts. After DreamWorks' collapse in 2005, Emerson Drive signed to Midas Records Nashville, where they resumed their streak of hit singles, including their first Number One single in "Moments". In summer 2008, Midas Records closed their country division. Emerson Drive then signed with The Valory Music Co. and the CD which Emerson Drive had been working on, Believe, became a co-partnership with Midas Records, who kept ownership of the CD while The Valory Music Co. was in charge of promotion and distribution of Emerson Drive and Believe.